Thursday is all about the Throwback these days and because of that, we thought it might be fun share some of the interviews we’ve done that were originally posted on Daps Magic. Chef Justin Beckett, owner of Beckett’s Table and Southern Rail was one of the first interviews I did for Geek Eats and was the first big chef to really give me the opportunity. I was fortunate to meet him at Devoured Phoenix. After embarrassing myself by volunteering to peel eggs with local food blogging superstar Joanie Simon for his deviled eggs demo (life always seems to channel deviled eggs for us), I chatted with him (more like gushed like a One Direction fan girl) and that’s where it all began. An acclaimed entrepreneur and innovator, Chef Justin Beckett is a leading force in Phoenix’s rising culinary scene. The son of a pastry chef, Justin’s parents were passionate about food, helping to foster a love for cooking that started at the age of ten. By 18, Justin had lived in five states and three countries, from New Hampshire to Guatemala, which allowed him to draw upon a multitude of cultures and flavors in his own creations. After completing his studies at the California Culinary Academy, Justin was recruited for a cooking position at Roy’s Hawaiian Fusion® Cuisine in Pebble Beach before crossing the Pacific for a position at Roy’s Kahana Bar & Grill in Maui. Following his fervor for culinary knowledge, Justin then traveled to Europe for a three-month apprenticeship which led to a stint as a personal chef for Countess Von Galen of Germany. Upon returning to the States, Justin rejoined the team at Roy’s, leading the opening of the brand’s Scottsdale location. At the helm of the kitchen, Justin was responsible for creating innovative nightly specials while ensuring the careful execution of the renowned restaurant’s nationally celebrated dishes. After brief stints at the helm of other Valley restaurants, Justin indulged his innovative nature taking on the role of executive chef and partner of Creative Hands Cuisine. 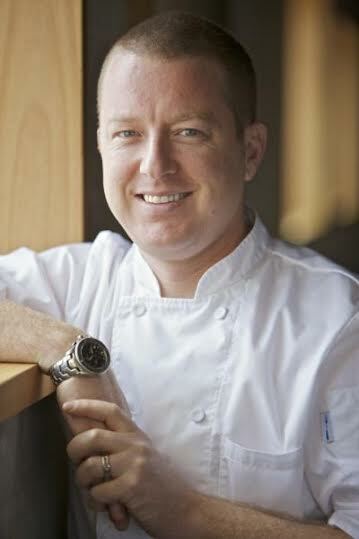 There, Justin helped shape aspiring chefs and forged creative catering techniques for a variety of high-end events ranging from intimate dinners to extravagant weddings, eventually leading him to be named the preferred caterer of Nordstrom. Though successful in the kitchen, Justin sought industry growth and pursued an opportunity to expand his knowledge of the business as a consultant with Bottomline Hospitality Group. Here, he created efficiency systems to promote profitability and seamless execution while lowering costs and improving quality of kitchens across the state. While in his role with Bottomline, Justin drew upon his diverse experience to play a hand in the development of some of Arizona’s most notable restaurants, including all of the food and beverage programs for the iconic Hotel Valley Ho following its 2004 restoration. From creating the menu to compiling operation manuals and orchestrating personnel, Justin implemented programs for the resorts banquet services, in-room dining, poolside eatery, Cafe Zuzu and the satellite restaurant Trader Vic’s. Striving for ongoing professional progress, Justin then joined Southbridge Restaurant Group as director of culinary development. Working closely with Fred and Jennifer Unger, one of the Valley’s most respected development partnerships, Justin conceptualized, designed, built and launched four additional dining establishments – marking 16 restaurants opened under his direction. He quickly became a trusted advisor for Southbridge’s executive team, providing guidance on all aspects of operations. In 2010, Chef Beckett became his own consultant as he joined forces with his wife Michelle and their longtime friends and sommeliers, Scott & Katie Stephens, to open his own concept in 2010. Located in the popular Arcadia area, Beckett’s Table is the chef-driven extension of Justin’s own home. 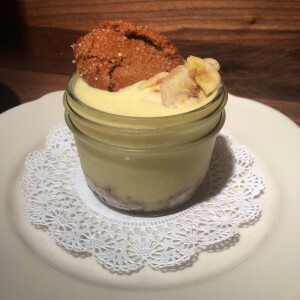 Warm and comfortable yet sophisticated and intriguing, Beckett’s invites folks to come together over familiar classics with inventive touches. The space, designed with the owners’ personal residences in mind, features an expansive open kitchen, wine cellar wrapped in barrel staves and exposed bow truss ceiling beams. Beckett’s Table menu of seasonal American cooking features something for everyone, including a variety of gluten free and vegan options, a midst comfort food mainstays. Not to be out done by the culinary delights, the wine program at Beckett’s Table is exceptional, expansive and absolutely approachable. A recipient of Wine Spectator’s 2012 and 2013 Award of Excellence, Beckett’s Table’s wine list contains more than 50 wines available for $50 or less, including 40 labels by the glass. Following the success of Beckett’s Table, Justin and the ownership team set out to open a second concept in uptown Phoenix. Warm and centered around community, the highly-anticipated Southern Rail opened its doors on May 30, 2014. 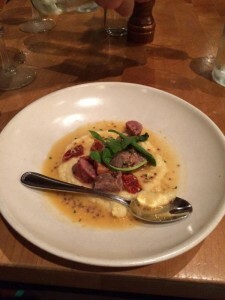 The vibrant restaurant offers Chef Beckett’s inspired interpretations of the diverse flavors of the American South; from the “lowcountry” cooking of the coastal Carolinas to the famous Cajun and Creole fare of New Orleans, and the slow-smoke barbecue of south Texas. A robust American beverage program, overseen by owners and sommeliers Scott and Katie Stephens, and touches of the South’s well-known style of hospitality complement the Southern Rail menu. After a varied resume, Justin seems to have found his niche as one of the Valley’s most talented and creative chefs and already esteemed restaurateurs. Dedicated to the community that’s shaped him, Justin is active in Arizona, serving on the Arizona Restaurant Association’s Board of Directors and sourcing a majority of his products from local purveyors all while raising awareness of the Valley’s growing culinary scene. He is equally committed to shaping the chefs of tomorrow through his roles in Devour Phoenix and his own foundation, Feed Your Dreams. 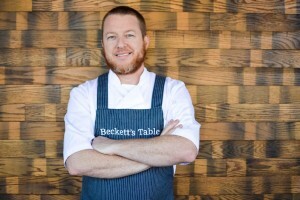 Since opening Beckett’s Table and Southern Rail, Justin’s culinary prowess has also earned him national attention with a 2012 nomination for Food & Wine magazine’s People’s Best New Chef award and a 2014 invitation to cook for Condé Nast publications, proving the future is bright for this young culinary star. I have been cooking since I was in 7th grade but professionally since 1995, My first sous chef position was in 1997, my first chef position was in 1999. I have always loved food and cooking. The idea of creating something with my hands that nurtures other people is pretty cool. I also remember having a conversation with my mom about helping out around the house and I thought the kitchen would be a good spot so I started cooking for my family. I attended the CCA (California Culinary Academy) straight away after high school. It was the shortest summer ever! Four days after graduating high school I started at the CCA. I believe that school was a great foundation for me but my real education started 18 months later when I started working in restaurant kitchens. Totally not a fair question… I love to cook good food that is exciting to eat. I think the biggest realization is that I got into this business because I love to play with food. Although I do get to play with food every day, there are so many things that fall onto my plate (no pun intended) like repairs, staffing, training, pr, social media, etc… No one can prepare you for all the items/to-do’s that come up every day in a restaurant(s). I never go hungry… AND I really like leading a team of young culinary soldiers into battle every day. I think tv has really placed a focus on the culinary scene. This is great but sometimes paints a different than realistic picture for the general public about what it is to run and operate restaurants. All the people that I have worked with, present and past. I can’t just name one celebrity chef it has really been a group effort. What were your inspirations when you started both Beckett’s Table and Southern Rail? Your menus are changed seasonally, what is your favorite season? Why? I love summer flavors because of the colors and the finesse and “light” style of food, BUT I also really like building flavors in the winter with great stews and braising. Mise en place loosely translates to everything in its place. Make sure you prep the whole dish, clean and organize then and only then should you start to cook the dish. Preparation is so crucial to a happy clean organized kitchen. Another VERY important piece of advice is taste taste taste. Make sure you taste the dish from start to end, watching the flavors change and develop. Well it is not an easy profession, long hours, nights and weekends, always on your feet, the pay is not great, you don’t just graduate from school and become a chef… You have to work your way up through the rank and put in your time. If you are comfortable with all that then you will be taking on a wonderful career where you will get to use your creativity, people skills, strategy, charm, showmanship and business savvy every day. See below for Chef Beckett’s Wood Oven Roasted Brussels Sprouts, one of the most popular dishes from his restaurant, Beckett’s Table. I’m still really thankful for Chef Beckett taking the time to do this interview. It really started me (actually us) on the current path and without his kindness Geeks Who Eat may never have become a reality. So once again, thank you Chef! We are so glad to have shared your table! Trim the bottom of the Brussels sprouts to remove the hard stem. Cut the Brussels sprouts in half from top to bottom. Scoop out the Brussels sprouts with a mesh strainer and place into a large container filled with ice. Once the Brussels sprouts are completely cooled you can strain them out and place them on a baking sheet, toss with oil. Place Brussels sprouts in a hot wood burning oven or grill, or a conventional oven set to 500 degrees, until the outer leaves are charred. Remove Brussels sprouts from the oven and scoop into a serving vessel. Top with the dressing, pancetta, and parsley.